It’ll soon be time to prep the turkey and bake the pumpkin pie, Thanksgiving is just around the corner and I have some simple yet lovely décor to wow your family and friends. Dressing up your dining table with some fall flair is the perfect place to start, since you’ll more than likely use it to serve the best game day buffet or scrumptious family feast. You don’t have to overdo it here to make a statement. Pumpkins, candles, and flowers can make a beautiful table, and don’t require much effort. For the pumpkins, a few small (or different sized) will do the trick. When it comes to candles, you can go with a favorite fall scent but a simple colored or even neutral colored candle works beautifully and may not conflict with all the other mouth-watering smells. For the flowers, grab some greenery and/or flowers from the grocery store. You can use a vase (narrow opening may work best) or different size vases to create volume. Place greenery and flowers in vase(s) and place around pumpkins and candle. You can also find pretty leaves from your yard and place those down the center of the table instead of flowers. Many living rooms have a fireplace as the centerpiece. Dressing up your mantel for the season is a great way to make this room feel special. A bit of garland goes a long way on the mantel. 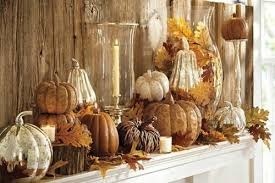 Some fall-colored flowers, pinecones, and/or candles are great for mantel decor. Drape some cotton branches or fall garland, along the mantel to really make your space feel festive. Make the room feel warm and welcoming with a few cozy throws and pillows. Textures like fur and wool add a beautiful fall touch. The kitchen is another great place to add a touch of fall. Find a few spots to place your accents, making sure they’re visible (be sure not to let them crowd your way). Natural elements like a large pumpkin and pinecones piled in a bowl are all you need. Add cinnamon essential oil to the pinecones to give a lovely fall smell. From family dinners to formal gatherings, you can add a touch more fun with these simple accents. Focus on where your family and friends spend the majority of their time can help everyone feel welcome and warm throughout the season!